The development of new coal fired power plants is not recommendable because burning coal produces massive carbon emissions. Yet governments around the world are investing in coal fired power plants non stop. Every week more than two coal powered plants go into operation. The controversy is reaching new heights in the UK, where the government is close to endorsing plans by the country’s largest polluter, energy company E-on, to build a plant in the Kent town Kingsnorth, without a strict agreement on the installation of carbon capturing technology. Brits are known to be among the more aggressive countries in pursuing measures to reduce carbon emissions and the country has already achieved its Kyoto Protocol targets more than twice over. This makes the question all the more interesting of what it is that possesses a government which is definitely serious about the environment to consider building new coal-fired energy plants. A large part of the rationale for Britain to build more coal-fired energy plants is that there’s plenty of insecurity about the currently available energy resources. And the government says it is committed to rolling out new plants in as clean a way as possible. Scientists are confident that they have found efficient means to reduce carbon emissions by 99%. Yet for their theories to be proven right, they will actually have to be applied in new power plants. 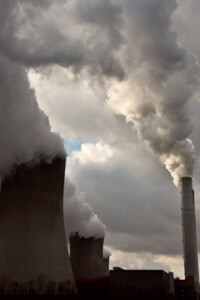 The European Union has committed to building around a dozen new plants to simply test out whether the latest carbon capture and storage (CCS)technology really works and is going to adjust regulations according to the outcome. But the EU is far behind schedule because few governments are willing to stir up a controversy by playing guinea pig. That is why the rest of the world is looking on with keen interest to the current goings on in Britain. The small town of Kingsnorth in Kent is where all the action takes place. The UK government almost certainly will okay plans by the German energy company Eon to build a new coal fired energy plant, despite strong protests. Greenpeace activists have been joined by numerous campaigners who’ve set up a permanent campsite at the disputed location. What infuriates the protesters the most is that Eon, already the biggest polluter in the UK, will likely be given the go ahead without the clear condition that if the technology does not work, it will close down the plant. If such a condition were made, the UK policy makers would be in line with EU plans, which are also very similar to the approach taken by the State of California, which gets companies to commit to reducing carbon emissions at least by 90% or cease operations. The UK government is not inclined to such strict rules, according to Greenpeace activists who got hold of correspondence between the E-on and government officials. Though in the overall energy scene, the UK government focuses on diversification. Only days after the leaked correspondence with E-on was made public, the energy ministry announced that the UK will be generating 30 to 40 per cent of all its electricity needs from renewable energy by 2020. That goes to show that to talk of a renaissance of fossil fuel energy generation is a slight exaggeration. The UK newspaper The Guardian published an interview with the country’s energy minister Malcolm Wicks in which the minister did his best to appear equally concerned about the environment as the protesters at Kingsnorth, saying that “all is lost on global warming” unless the world finds a new clean coal technology in the next few years. The immediate reason for the government’s approval of the Kingsnorth plant is cost efficiency. Coal is among the cheapest and most reliable resources around these days. If we were to have a moratorium on coal-fired stations … we would therefore most likely become more dependent on gas. I don’t want to exaggerate, but gas comes from some fairly unstable parts of the world and some not readily associated with human rights and democracy,” said Wicks in the interview. Another reason is that despite the uncertainty about the efficiency of carbon capturing, the government is hell-bent on promoting British scientists, which are in the top five countries in terms of developing quality solutions. Even though it’s expected that most of this technology is going to be exported abroad, the risk of falling behind is great if no plants are built in the UK itself. But campaigners are skeptical about this theory. They say the government is being bullied by E-on. If one thing is certain it is that prioritizing the environment is hugely dependent on expensive technology at a time that energy costs are rising sky high. Thus far it has been easy for governments to believe that the development of ‘a market’ for this technology is bound to happen because of the sheer number of new plants being built. Yet China and India’s governments might be hesitant to collaborate. The status of play of the world’s largest project to reduce carbon emissions of power plants in the third world does not inspire much confidence. Recent research by two Stanford scholars revealed that of 3,000 companies in the third world applying for grants to install technology for carbon reductions were not serious at all. Nevertheless, the Kyoto Protocol Clean Development Mechanism (CDM), the world’s largest carbon market, had reserved up to $10bn worth of credits which Western companies would normally buy to offset their emissions. Technology is going to be the name of the game no doubt in years to come and hopefully skeptics will have fewer reasons to be cynical as the competition for this technology takes off. One big piece of the puzzle here will be how governments set out the rules. Analysts at Standard & Poor’s put out a report recently saying that for the time being there appears to be a consensus that CCS will be an integral part of the solution to climate change. But the high costs prevent companies from implementing the technology. The onus is pretty much on the government because companies simply believe it’s not economically justified to invest when CO2 reduction requirements are likely to be small, according to Standard & Poor’s assessment. The analysts, who published a report entitled Global Power Report in June 2007, believe that other, less expensive approaches to CO2 reduction are way more popular.